Discover teamed up with the National Hockey League (NHL®) on Monday to surprise 100 members and their families at one of the 18 Boys & Girls Clubs of Chicago with a visit from the most revered trophy in professional sports, the Stanley Cup®. As part of its newly established partnership with the Boys & Girls Club of Chicago, Discover, the Official Credit Card Partner of the NHL®, hosted a Safe Halloween costume and trick or treat party at the Club for members and their families. 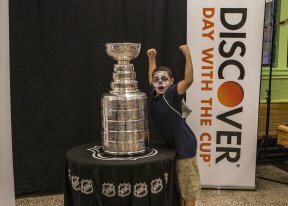 After kids arrived, Discover provided an early Halloween surprise as volunteers unveiled the Stanley Cup® and helped the kids take group photos and participate in a hockey shootout game. Discover surprised the Boys & Girls Club of Chicago yet again at the event with a $25,000 donation, on top of a $75,000 donation earlier this year that kicked off the partnership as part of the company’s commitment to education. Discover’s partnership with the Club helps fund a youth reading program, technology upgrades and Club maintenance. © 4803 Chicago Hispanic Newspaper, Lawndale News, Hispanic Bilingual Newspapers, Su Noticiero Bilingue. All rights reserved. XHTML / CSS Valid.